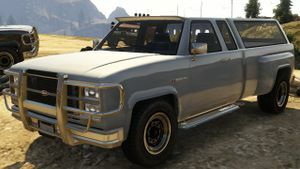 A Bobcat XL in Grand Theft Auto V.
The Vapid Bobcat XL is a pickup truck in Grand Theft Auto V. Like the Bobcat from Grand Theft Auto IV, the Bobcat XL is based on the 1985 Chevrolet C-10; however the Bobcat XL has a longer wheelbase and larger cargo bed. The rear wheel wells suggests that the Bobcat XL has a dual rear wheel axle; however, the truck only has a single rear wheel axle, although the rear tires are wider than the front. Like the Declasse Rancher in GTA IV, the Bobcat XL can appear with or without a camper shell. All Bobcat XLs are equipped with a grille guard. A Bobcat XL in the Franklin Trailer. A Bobcat in GTA V (Rear quarter view). This page was last modified on 10 September 2016, at 03:34.